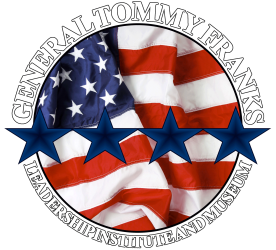 During the 2019 Celebration of Freedom, The General Franks Leadership Institute and Museum will be taking time to honor our veterans. We encourage you to register veterans in the local area and those that will be in attendance at the 2019 Celebration of Freedom so we may honor them on stage! If you know a veteran that should be honored as a part of the Celebration of Freedom, please take a moment to fill out the following form so we can invite them to be a part of the 2019 Celebration of Freedom! ​Thank you for helping us honor our veterans! Please provide us with your name and email when registering a veteran, so if we have issues getting in touch with the registered veteran, we will be able to follow up with you and make sure we don't miss anyone! Thank you.